A child escaped serious injury after a shoplifting call resulted in a pursuit and crash Saturday evening in Indianapolis. 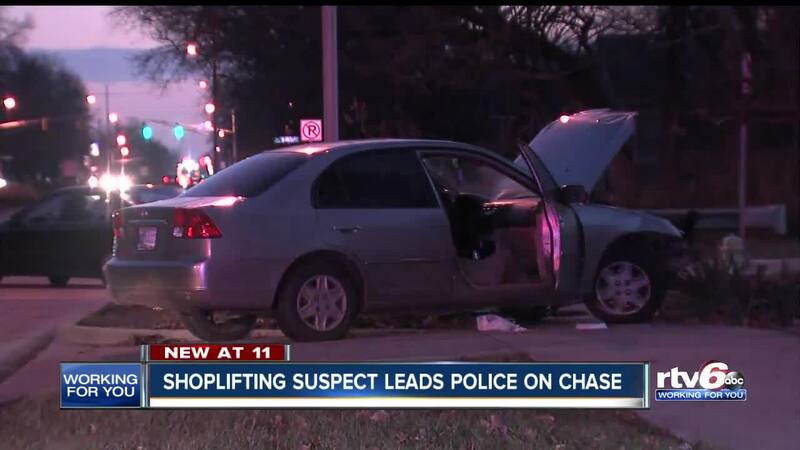 INDIANAPOLIS — A child escaped serious injury after a shoplifting call resulted in a pursuit and crash Saturday evening in Indianapolis. Indianapolis Metropolitan Police Department officers responded just before 6 p.m. to Kohls, 8141 E. 96th St., on the report of a shoplifter. When police arrived, the suspects fled in a vehicle. Police chased the vehicle before it crashed near E. 21st St. and North Emerson Avenue. A two-year-old child was unrestrained in the vehicle at the time or the crash. IMPD said the child was not injured but was taken to Riley Hospital for Children as a precautionary. IMPD says the suspects involved were also taken to Eskenazi Hospital after complaining of pain. It is unknown at this time if charges have been filed.